It is with a cautionary note that I propose some of my personal lessons learned from the tragic loss of the crew of Space Shuttle Columbia. I have spent ten years comparing stories with others who were part of or close to the Shuttle program in the years leading up to the loss of Columbia and her crew… so I admit to being less than a reliable independent eye witness. That said, I will offer a few lessons that have driven me nearly every day since that sad Saturday in February 2003 in my jobs as a spaceflight safety advisor both in and out of NASA. They fit into three distinct but related categories: Flight Test, Complacency, and Checks and Balance. This photograph was taken aboard Columbia during STS-107; it was developed after the crew’s death from film recovered in the wreckage. From top left: David M. Brown, William C. McCool, and Michael P. Anderson. 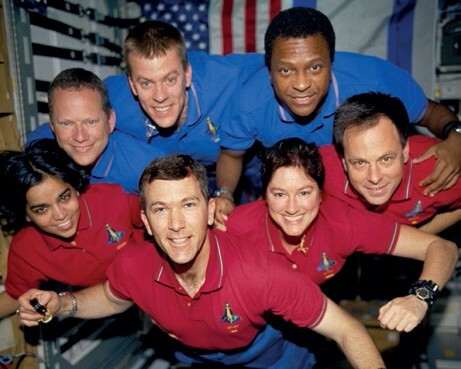 From bottom left: Kalpana Chawla, Rick D. Husband, Laurel B. Clark, and Ilan Ramon (Credits: NASA). When I hear people talk about flying a very short flight test program with the next human spaceflight system development, and then declaring it “operational,” I cringe. The fact is that the Shuttle never was purely “operational.” In retrospect, it was a 30-plus year flight test program during which NASA performed a variety of operational mission objectives. It would have been good for us to periodically remind ourselves and our stakeholders of that fact before, not just after the big accidents. Success, or more honestly, the perception of success, fosters complacency. And we all know what comes of complacency. To be sure, through the 1990s the Shuttle program had experienced a long run of “successful” missions. We were bringing back the crews, we were accomplishing the mission objectives, and managing the cost and schedule relatively well considering the complexity of the program. Most importantly, we believed we were putting the right attention on the decreasing number of technical issues we experienced in flight. But when, after the accident, we donned the corrective lenses of the mishap analyst, it became clear that we had been fooling ourselves in some catastrophic ways. The hardware had been talking to us, and what we had believed at the time to be rational risk management looked in retrospect more like rationalization of inconvenient warnings. It was not a coincidence that we found ourselves under a great deal of pressure to meet impossible schedules and to cut costs even to the point of planning for privatization. An enlightened high performing organization includes humility as a critical criterion for promoting its best and brightest to leadership positions. And to aid these humble leaders, it espouses some form of devil’s advocacy as an important component of its high stakes decision-making. After the Columbia loss, NASA learned – or re-learned – that a competent, adequately-resourced technical authority and a respected safety advisor provide necessary checks and balance for the decision maker as he/she strives to “bring out the whole truth” of the inevitable technical challenges. When all is said and done, NASA and the aerospace community learned much from the Columbia loss, but I believe most of the lessons learned fall into one or more of the three categories I’ve listed. They should be continuous considerations for any future human spaceflight endeavor. Bryan O’Connor was Shuttle pilot on STS-61B in 1985. After the loss of Challenger, he was given a number of safety and management assignments. In 1991, he commanded STS-40. In 1993 he became Director of the NASA Space Station Redesign team and, in 1994, Director of the Space Shuttle Program. In June 2002 he became NASA Associate Administrator, Office of Safety and Mission Assurance (OSMA). In 2004, following the Shuttle Columbia accident investigation conclusion, his title changed to NASA Chief, Safety and Mission Assurance and his functional responsibilities enlarged. Bryan O’Connor is recipient of the IAASS Jerome Lederer Space Safety Pioneer Award 2011. This article was originally published in Space Safety Magazine Issue 6, Winter 2013 on the occasion of the 10th anniversary of the loss of STS-107.